Tevita Cavubuti played for Fiji against Wales in November. Here he is tackled by Justin Tipuric who will be a team-mate at Ospreys. 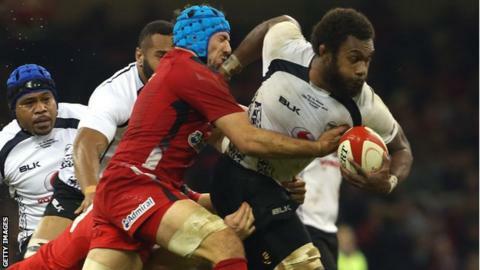 Ospreys have signed Fiji international second row Tevita Cavubati until the end of the season. The 27-year-old arrives at the Liberty Stadium after injuries to Lloyd Peers and De Kock Steenkamp left the Pro 12 leaders with Alun Wyn Jones and Rynier Bernardo as their only fit locks. Cavubati was in the Fiji team which lost 17-13 to Wales in November. "This is a great opportunity for me and I'm really excited and looking forward to it," said Cavubati. "Having played against Wales at the Millennium Stadium in the autumn internationals I know what quality players there are at the Ospreys and how Welsh supporters get behind their team." The six feet seven inch Fijian weighs-in at over 18 stones and has been playing for Tasman in the ITM Cup. He has made four appearances for Fiji, and his arrival comes with the Ospreys facing two derby matches against Scarlets in the space of space of a week. The Swansea-based region are also likely to be without former Lions Test captain Jones while he is on duty with Wales during the 2015 Six Nations championship. Ospreys rugby manager Andrew Millward says Cavubati's arrival is timely for the Ospreys. "Tevita will provide some experience and hard nosed physicality, providing support to Alun Wyn and Rynier," he said.